And since cadmium’s half-life in the body is about 30 years, about the same levels that were present in August, would also still be present by Srila Prabhupada’s departure date of November 14, 1977. Thus the poisoning that started at least as early as late February 1977, continued at approximately the same lethal levels until November 14, 1977, a period of almost NINE MONTHS. An ordinary man surely would have expired much sooner due to such a heavy poisoning by a heavy metal (cadmium) that has no known biological benefit and which is NOT a deliberate ingredient in any medicine, Ayurvedic or allopathic. Srila Prabhupada took no cadmium medicines, as there are none. Even medicines, water, sundries, or whatever that might have been contaminated to some small degree with cadmium, could not have produced even a tiny fraction of the actual levels found in these three hair samples. 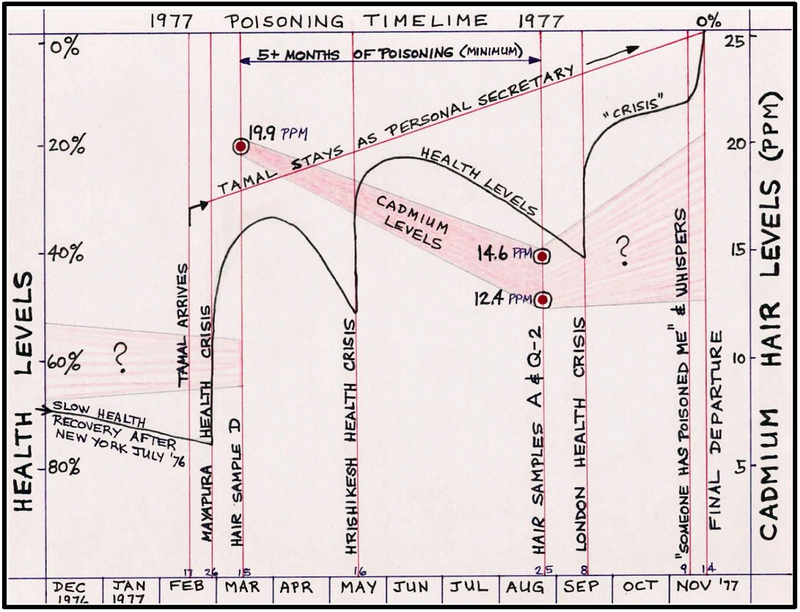 Above is a chart which depicts approximations of the poisoning timeline.